I found the cutest marshmallows at the grocery store! 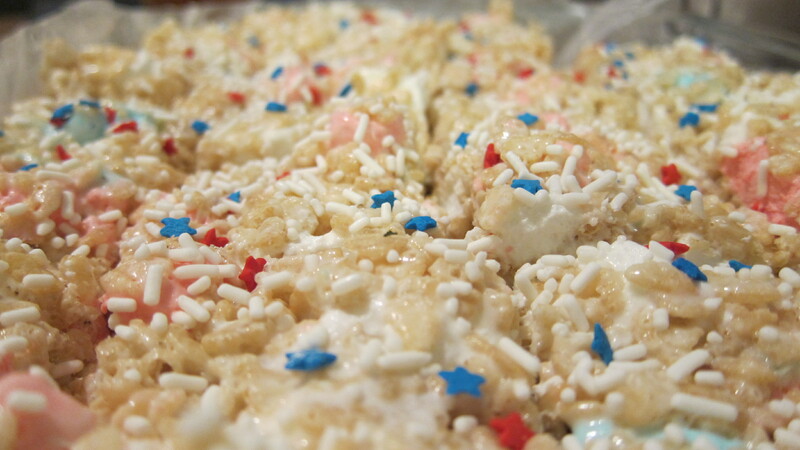 I thought… “these would make great 4th of July rice crispy treats!” Until I realized that the recipe calls for the butter and marshmallows to completely melt together and they’d really make a nice shade of purple. 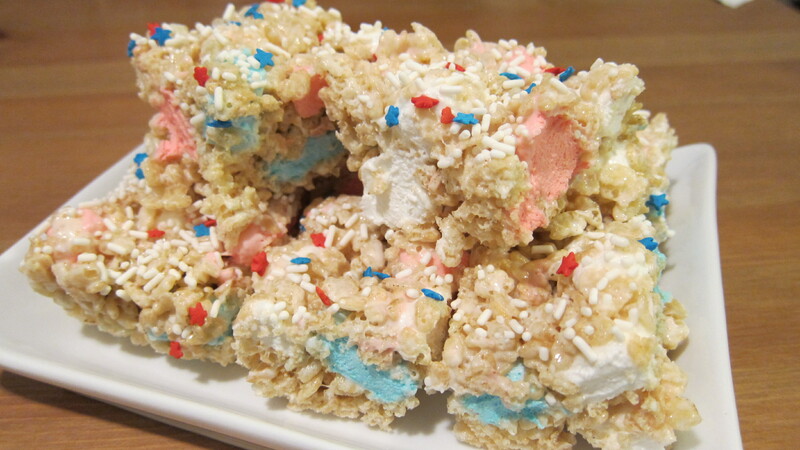 Then it came to me… DOUBLE MARSHMALLOW rice crispy treats. Now that’s a reason to celebrate! Line a 13 x 9 pan with wax paper. In a large saucepan melt the butter and white mini marshmallows. In the normal crispy treats recipe, there would only be half the amount of butter, but I figured I’d throw a little extra in since I was doubling the marshmallows. In a large mixing bowl stir together the colorful star marshmallows and the crispy rice cereal. (I added in a little more cereal than usual here too). Add the buttery mix to the rice mix and stir until all of the rice is coated. Press mixture evenly into the pan and let cool. The treats were wonderfully sweet, sticky, and crunchy. You definitely couldn’t tell “real butter” wasn’t used and they were 10 times better than store bought.